Playing since the late 80s, Nick Saloman’s legendary Bevis Frond have been consistently keeping alive the woodsy, quirkier side of psychedelic rock. On this 1995 single, Saloman and crew blast out in full power. …that is until the organ fades out to some stock recording of an audience’s mild-applause and what nearly sounds like a short snippet of The Three Stooges. Then one is reminded of Saloman’s excellent sense of humor and his great ability to make the listener smile. Driving, torrential rock, surreal lyrics, chill pastoral vibes and good humor all wrapped up into one 7″. What more could a listener ask for? 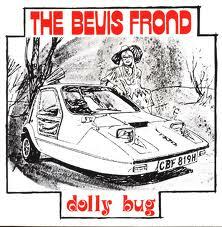 PS: The Bevis Frond have a new record out and are currently touring. If you know what’s good for the soul, you’d be checking both of these facts out right now. Previous Previous post: Elizabeth Cotten – Live!